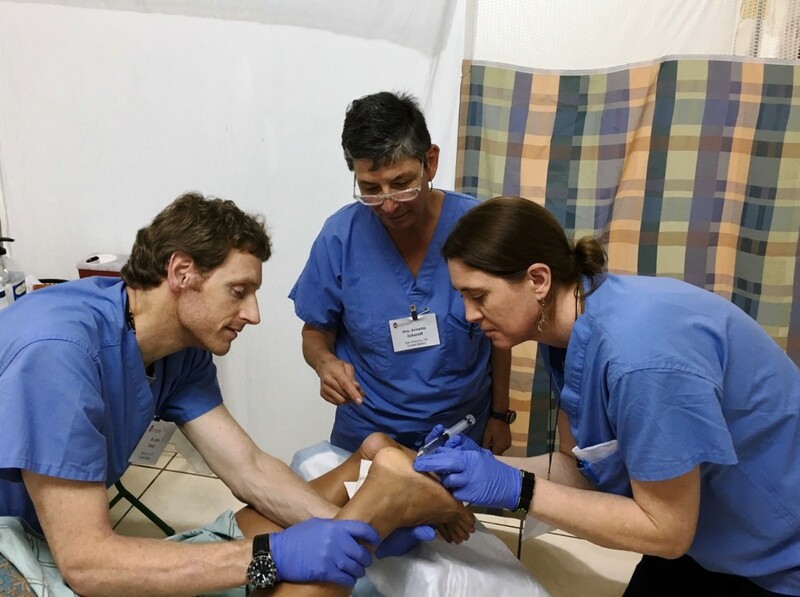 SAN ANTONIO, TX – Sports medicine expert Dr. Annette Zaharoff, a pioneer in the use of regenerative injections to treat pain and musculoskeletal injuries, says her 10th mission trip to Honduras marks a milestone for proponents of Prolotherapy. Dr. Zaharoff served as co-clinical director for the Honduras mission. A major focus of the non-profit Hackett Hemwall Patterson Foundation (HHPF) is to train physicians from across the globe in the latest in prolotherapy techniques. Dr. Zaharoff serves on the board of the Madison, Wisconsin-based foundation and as its Director of Education. Physicians from across the globe had the opportunity to earn two types of Continuing Medical Education credits, or CMEs, during the trip organized by the HHPF. The two-week mission recently concluded after treating thousands of indigent Hondurans with Prolotherapy, a regenerative injection technique to treat damaged tissue and joints to promote healing. Prolotherapy involves the injection of a solution of dextrose (the body’s naturally produced sugar) and lidocaine into damaged tissue or joints to help promote healing. Osteoarthritis and other forms of arthritis can be treated with Prolotherapy, along with joint and tendon damage resulting from sports or work-related injuries. Prior to beginning their work in the Prolotherapy clinics, the physicians met for a daylong series of hands-on labs and educational workshops to learn best practices for using Prolotherapy to treat different areas of the body. Following the educational workshop, physicians and volunteers travelled to the towns of La Ceiba, Olanchito and Tela to set up makeshift clinics to provide Prolotherapy injections to thousands of Honduran patients. Last year, CMEs were offered for the first time for physicians who successfully completed the study guide for Prolotherapy treatments on the knee. This year, providers could earn CMEs for study of Prolotherapy treatments on the knee and the elbow. The CMEs are being offered through the University of Wisconsin. Dr. Zaharoff believes additional CMEs will become available in the near future. Dr. Zaharoff has helped the HHPF to develop Prolotherapy treatment study guides for the upper and lower limbs as well as the spine. These study guides are becoming the global model for Prolotherapy training. Dr. Annette Zaharoff, a former professional tennis player on the WTA circuit, heads the Non-Surgical Center of Texas on Huebner Road (www.drzmd.com). An expert in Rehabilitation Medicine, Dr. Zaharoff is recognized for utilizing cutting-edge, non-invasive treatments such as Stem Cell therapy, prolotherapy, platelet rich plasma injections with ultrasound guidance and acupuncture, often paired with physical therapy.